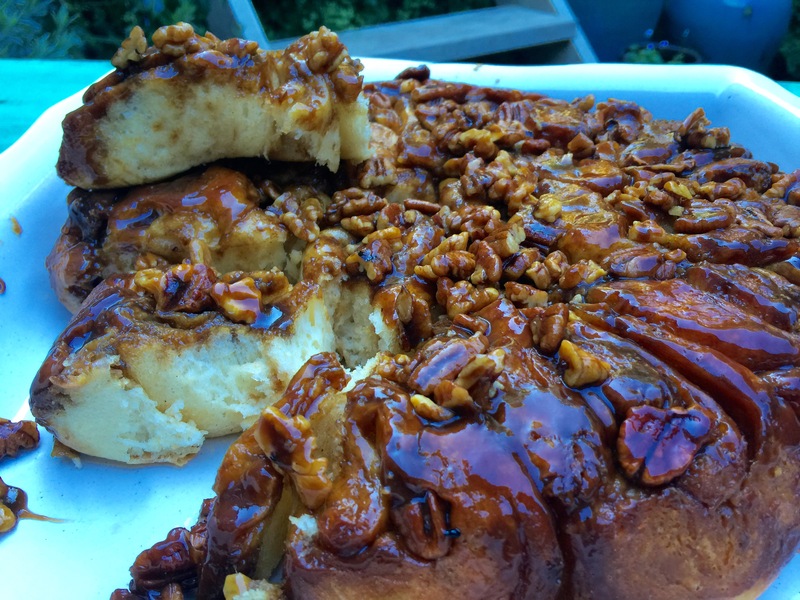 Here is another venture into the world of sticky buns, cinnamon scrolls and brown sugar sweet treats. I love my bread making, and I am pretty keen on making enriched dough at the moment. 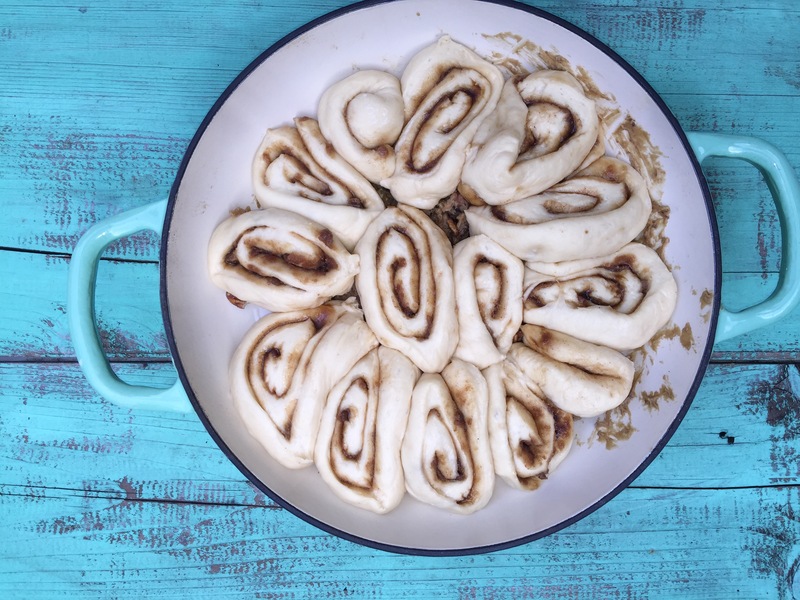 This recipe is my take on Sticky Buns from the Great British Bakeoff and the inimitable James Morton’s Cinnamon Buns. 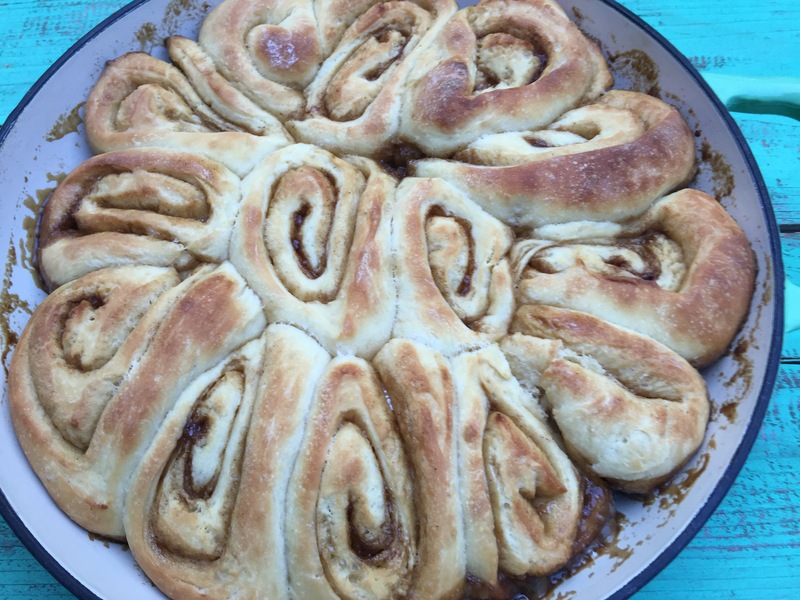 It’s an enriched dough filled with brown sugar, butter and cinnamon, and topped with MORE brown sugar, butter, maple syrup and pecans! James Morton cooks his buns in a casserole dish or pot such as a Le Creuset, as the heavy sided baking dish creates softer buns. He’s right – it’s the way to go for beautiful soft unctuous buns, so I recommend you try this baking method. Whatever you bake your buns in, make sure that the dish or pan has a rim, as the topping might flow over during cooking. Place the flour, salt, yeast, sourdough starter if using, sugar, tepid milk, egg and cinnamon into a large bowl and mix them together by hand or you can use an electric mixer with a dough hook. Knead by hand or in the mixer about for 10 minutes. Melt the butter and add to your dough. Mix it in by hand or use a machine until completely combined. Cover the bowl (I use a disposable shower cap but cling film is fine) and leave the dough to rest for 60-90 minutes at room temperature, or overnight in the fridge, until it has grown to roughly double its original size. Turn your dough out onto a lightly floured surface and roll it out into a big, long rectangle. The rectangle should be about 20cm wide and up to a metre long. Melt the butter and brush over dough. Sprinkle the dough all over with brown sugar and then cinnamon. Roll up the dough along its long edge into as tight a cylinder you can get, but be careful as the dough is quite fragile. Slice this cylinder into 6-9 roughly equal pieces using a knife. For the topping, process the butter, brown sugar and maple syrup until thoroughly mixed in food processor. Grease a large lidded casserole dish and spread the mixture evenly over the base of the dish. Scatter the chopped nuts over the base of the dish and gently press in. Arrange the buns cut end down in the casserole dish. Place the lid on the casserole and leave to rise for another hour at room temperature, then check to see that buns have risen. 30 minutes before baking, preheat your oven to 180 degrees C fan forced. Put the lid back on the casserole and place in the oven. Bake for 20-25 minutes with the lid on and 10 minutes with the lid off. Remove from the oven and run a knife around the inside of the dish to loosen the buns. Leave for 3-4 minutes for the bubbling to subside – no longer as the caramel will set. Carefully invert the dish onto a plate with a rim, again to stop the topping spilling over. Lift off the baking dish. The buns will be sitting up beautifully covered in the lovely caramel topping! 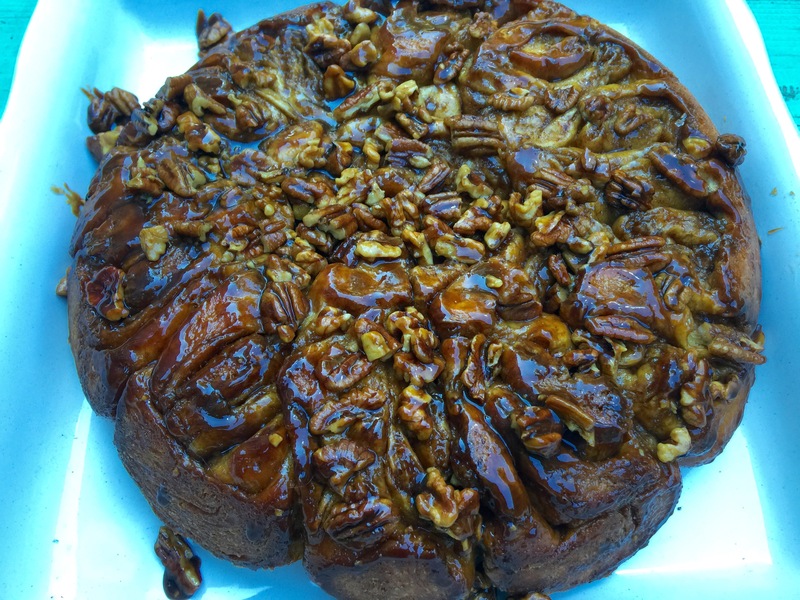 Posted in Bread, Buns and Scrolls, Cakes, Sweet Food and tagged caramel, Cinnamon Buns, Cinnamon Scrolls, enriched dough, Great British Bakeoff, James Morton, maple syrup, pecans, salted caramel, Sticky Buns, walnuts. Bookmark the permalink.